I am char grilled & fried here in this arrid desert at 41° Celcius just outside of Abu Dhabi and can't wait to fly back to the warm and humid Singapore! Inside the office is about 19° Celcius so you can imagine how drastic it is to walk in and out of the building. The heat is not just from above your head but it feels like it's coming from every direction. Definitely not good for my baby-smooth skin :) I am puzzled why people chose to live in such a hot oven! Can't they all just move to equator? Visit Google Maps and enter this coordinate: 24°19'38" N, 54°31'15" E if you want to know where I am in UAE. 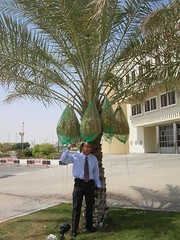 I am doing some quick consultancy work for the industrial developer of Abu Dhabi called ZonesCorp. It's quite an impressive job they have done here converting a desert into an industrial landscape attracting investment dirhams from every parts of the world. Nevermind the heat. Food and beverages are great here. Last night I had the best shwarma at Lebanese Flower restaurant downtown and if you get a chance to visit this city, get yourself a treat here. Gotta get back to work now so that I can spend some time visiting Dubai tomorrow.